We received a question regarding an iPad 2 3G being sold in the Saudi market but it’s intended for the US Verizon Wireless network. So we had to make sure everyone knows about it. 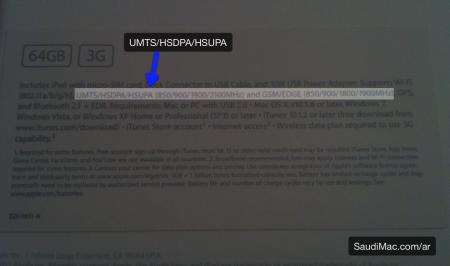 The 3G in iPad 2 units intended for Verizon does not work in Saudi Arabia and many countries. 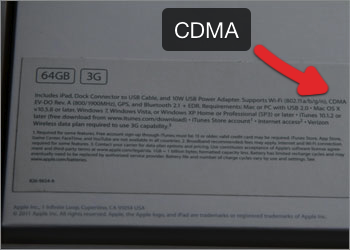 Verizon uses CDMA technology which is incompatible with GSM used by Saudi carriers (STC, Mobily and Zain). The 3G in these units will not work here. We highly recommend avoiding them. Here’s a photo I took of an iPad 2 3G for AT&T. It supports GSM and works with local Saudi carriers. Notice UMTS/HSDPA/HSUPA on the rear of the iPad 2 box. This iPad 2 3G model is sold world wide and unlocked in most countries. So are you sure the AT&T iPads would work in Saudi Arabia ? Can we also access the App stores successfully ? !